Chocolate Dipped Fruit Cones make the perfect sweet treat for kids and adults alike. They are fun to make and tasty to eat. My daughter helped me do both! You can watch her take over the chocolate role in the video at the bottom of this post. It was messy, but she sure did have fun! Isn’t that all that really matters these days? Assorted washed and cut fruit – we used apples, grapes, strawberries, raspberries, and blueberries. Feel free to use any fruit that is in season. Sprinkles, mixed nuts, and coconut flakes. Consider using other toppings such as crushed candy pieces. Save the waffle cone box. Dip your waffle cone in the chocolate covering all the sides and the bottom. Your kids can help with this part but make sure they don’t touch the chocolate or bowl as it may still be hot from the microwave. Immediately after dipping the cone into the chocolate, dip the cone in the topping. That can be the nuts, sprinkles or coconut flakes. Then, set cone upright in a space in the waffle cone box. Place the waffle cone box on a baking sheet to avoid any mess. Repeat steps with other waffle cones. Once complete, you can air dry or place them in the fridge for the chocolate to harden faster. 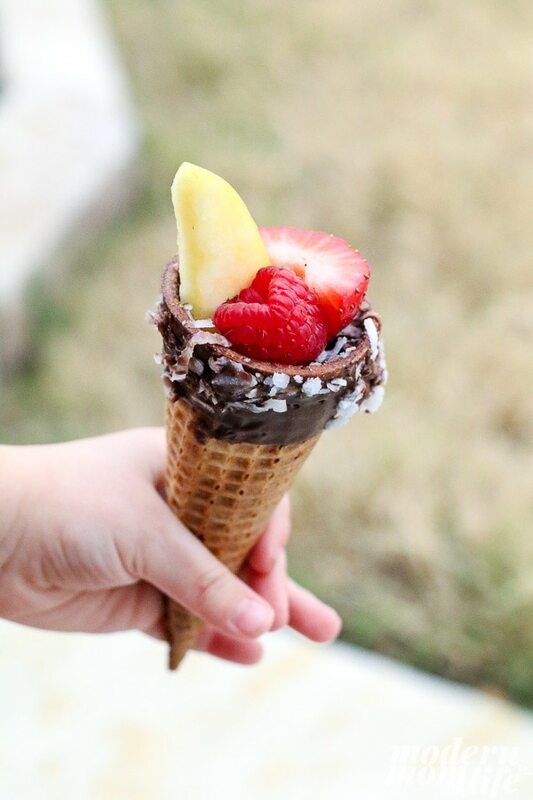 Once chocolate and toppings are dry and in place, stuff the cones with your fruit of choice. Get your kids in on the fun and have them do the same. Serve these delicious cones at any special event or simply just because. Your kids will enjoy making them as much as they will enjoy scarfing them down. Enjoy these delicious and simple to make chocolate dipped fruit cones. Top the chocolate rim with various toppings to make it unique. Assorted washed and cut fruit - we used apples, grapes, strawberries, raspberries, and blueberries. Feel free to use any fruit that is in season. Dip your waffle cone in the chocolate covering all the sides and the bottom. Your kids can help with this part but make sure they don't touch the chocolate or bowl as it may still be hot from the microwave. Immediately after dipping the cone into the chocolate, dip the cone in the topping. That can be the nuts, sprinkles or coconut flakes. Then, set cone upright in a space in the waffle cone box. Repeat steps with other waffle cones. Once complete, you can air dry or place them in the fridge for the chocolate to harden faster. What toppings and fruit are you most excited to make with these waffle cones? It sounds so fun! Thank you for sharing the tutorial!! This fruit cones is a great idea for the birthday party of my little lady.